Cindy Hoeft had never owned a donkey. A volunteer at the Harmony Equine Center, Cindy met Gerald, a miniature, after he was neglected and transferred to the facility with a group of horses. “The first time I met him he just melted my heart,” she says. These small donkeys can weigh up to 350 pounds at maturity, but Gerald weighed only 226 pounds upon intake. Fortunately, he had gained more than 50 pounds by the time Cindy adopted him, thanks to the care he received at Harmony. The little donkey made a smooth transition to life on Cindy’s farm where he lives with two horses, Nugget and Rowdy. “The horses instantly fell in love with him as soon as I brought him home,” she says. “I think he transitioned very well from Harmony to my house mainly because he was familiar with me.” In addition to the horses, Gerald has encountered ducks, chickens, dogs and cats in his new surroundings, and he’s eager to make friends with everyone. Miniature donkeys are known for their playfulness and affection, and Gerald is no exception. “He follows me everywhere. When I go out to the barn all I have to do is call his name and he comes running. It’s so cute!” Although this breed of donkey can live to be more than 25 years old, Gerald is still a youngster at the tender age of 2. Like any other 2-year-old, he loves to play with toys, including stuffed animals and buckets. 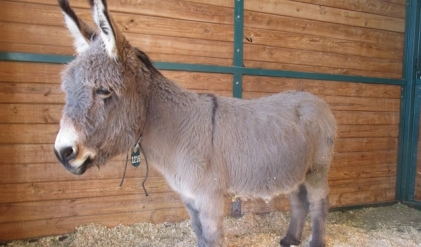 Miniature donkeys are very intelligent and can easily be trained to perform certain tasks. Cindy hopes to teach Gerald to pull a small cart, so that he can “help around the farm,” as well as pull her grandchildren around the property. “He definitely needs to be kept busy,” she explains.